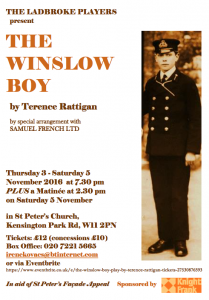 The Ladbroke Players are performing Terence Rattigan’s play THE WINSLOW BOY THIS WEEK from Thursday 3rd to Saturday 5th November at 7.30 pm, plus a Matinee on Saturday 5th at 2.30 pm, in St Peter’s Church, Kensington Park Road, W11 2PN. In aid of St Peter’s Façade Appeal. Please see attached flyer and mailshot for more info. 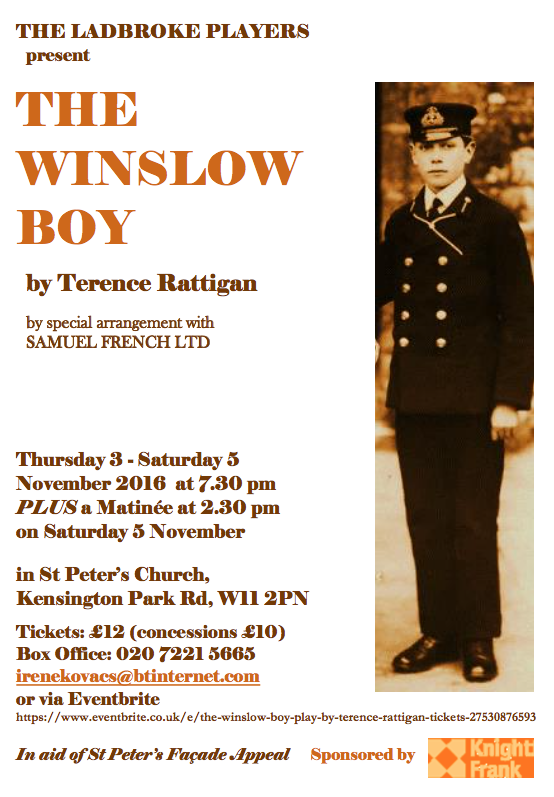 If you want to book online you can just search under “Eventbrite Winslow Boy” rather than using their fiendishly long reference number! Dates – 12-16th November 2013: 7:30pm plus a matinée Sat 2:30.